A family owned and operated restaurant serving the best Chinese and Asian food in the Lewiston & Auburn area for over 7 years. Come in for take out order or osit in and rder off the menu. Enjoy our Tiki lounge with lots of appetizers and exotic Polynesian drinks. Come in, sit back and relax and watch your favorite game with your family and friends or bring your laptop and link to our free Wi-Fi service. We offer delivery service and cater for large parties; delivery, carry-out and dining area can comfortably accommodate up to 60 people for any occasion (reservation required). 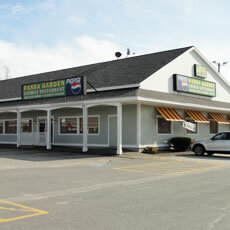 Located at 245 Center Street Plaza (formally Roak the Florist Mall) in Auburn, A family owned and operated restaurant serving the best Chinese and Asian food in the Lewiston & Auburn area for over 7 years. Come in for some delicious buffet or order off the menu. Enjoy our Tiki lounge with lots of appetizers and exotic Polynesian drinks. We offer delivery service and cater for large parties; delivery, carry-out and dining area can comfortably accommodate up to 60 people for any occasion (reservation required). Free WiFi available and online ordering on our website.